The quiet world began in darkness. Absence overtook the nothing that was. Saturated deep shadow before any silhouette could be seen. A breath was held before the first inhale. Blank silence. But God was. He created a black water all around, before there was any form or boundary. Cold murky heavens and seas blanketed the blind void. Not a shimmer, not a whisper, only deep darkness. God spoke into the black depth. “Let there be light”. Flash. A bright young sun overwhelmed the black beginning. Light was the first word on the lips of God in His world. The surrounding chaos was brightly lit by this warm word. Illumination highlighted every ripple of water, contrasted every shadow of that what was hidden. And so, God was not alone. In the beginning was the Word, and the Word was with God, and the Word was God. He was in the beginning with God. All things were made through Him, and without Him was not anything made that was made. And God saw that the light was good. God separated His light from darkness. All things bright and beautiful flourished in the light of day. But the night recalled the things that were not. God separated the night from the day, yet His creation grew darker and darker with every generation that was on the earth. One stormy night, the darkness swallowed life into the deep black waves. Nothingness, absence, silence crept back on the face of God’s earth. Yet a tiny ray of light pierced the deadly rain. A beautiful, colorful promise hung in the terrible sky. God’s promise had not been overcome. So, the light shined in the darkness, and the darkness had not overcome it. One soundless night men searched for wisdom. In the blackness of their hearts and the unknown deep from above, a tiny star shimmered in the midnight sky. It was an ancient light that the wisdom of man barely remembered. One dark silent night, the Light was born. 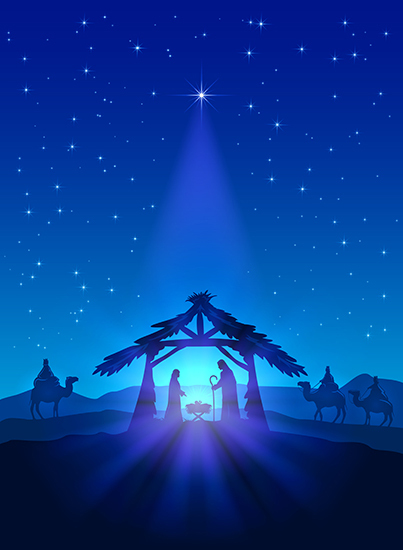 And the Word became flesh and dwelt among us. He was in the world, and the world was made through Him, yet the world did not know Him. The little baby took a breath and became an unexpected stranger among those who should have recognized Him. He came to His own, and His own people did not receive Him. The eternal Word grew from a boy to a man. In Him was life, and the life was the light of men. He spoke to them, saying, “I am the light of the world. Whoever follows me will not walk in darkness, but will have the light of life.” Yet man’s darkened heart could not see the light. Evening shaded the horizon as the Word, the Life, the Light approached the sunset at Golgotha. One dismal night there was darkness over all the land. He cried out, “It is finished.” The Word was silent. The Light was dead. Yet, a sparkle of blood and water dripped silently from His side. Flash. A bright morning sun overwhelmed the beginning of a new day. Light was the first word on the lips of God in His world, yet again. A Word of comfort broke the early morning twilight saying, “Why are you weeping?” The Light of the world spoke to His people by name. The Word of life shines, and the darkness can never overcome it. We have seen His glory, glory as of the only Son from the Father, full of grace and truth. The Word, the Life, the Light blazed brightly for those who could see and hear. To all who did receive Him, who believed in His name, He gave the right to become children of God, who were born, not of blood nor of the will of the flesh nor of the will of man, but of God. The Word became flesh and dwelt among us and His light still shines in our darkness. The Spirit now enlightens us with wine and water and words, with His blood and forgiveness and life everlasting. A hidden ray of light still pierces the rain. Our beautiful future sparkles in the terrible sky. He assures us that an even brighter day will come. God’s promise has not been overcome. So we wait longingly. The city has no need of sun or moon to shine on it—for the glory of God gives it light, and its lamp is the Lamb. By its Light will the nations walk, and the kings of the earth will bring their glory into it and its gates will never be shut by day—and there will be no night there.